Ithaca, New York, is a small cosmopolitan city in the beautiful Finger Lakes region of central New York State. Home to both Ithaca College and Cornell University, the city has an international flavor and is a cultural center for the region. Ithaca’s airport offers connections to flights from anywhere in the world. Financial Aid: International students are eligible for institutional merit-based aid. International applicants interested in applying for need-based aid must complete the College Scholarship Service (CSS)/Financial Aid PROFILE. Application Deadlines and Fees: Submit application by December 1 (Music, Theatre) or February 1 (all other programs) for August enrollment or by November 1 for January enrollment. A Finance major hones his skills in the Business school’s trading room then interns with a Wall Street financial firm. A Biology major coauthors a research study and presents her findings at a national conference. A Film major makes a documentary that’s featured in two dozen film festivals and launches his own film company before he graduates. Stories like these are common at Ithaca College, which excels at getting students ready for their futures. There are three keys to that readiness: theory, practice, and performance. At IC, you’ll learn from all three. You’ll choose from more than 100 degree programs in the Schools of Business, Communications, Health Sciences and Human Performance, Humanities and Sciences, and Music. If you’re undecided about your major—as many students are—our Exploratory Program will introduce you to a range of opportunities and provide the academic advising and support you need to choose the major that’s right for you. Students routinely double-major, double-minor, and combine fields of study in intriguing ways—Philosophy and Marketing, Biochemistry and French, and many others—tailoring their learning to fit their interests and career goals. The real world is interdisciplinary, and we think your education should be too. The Integrative Core Curriculum is a set of thought-provoking academic experiences that will connect your thinking across disciplines to help you shape your understanding of the world. You’ll also gain a broader perspective by taking courses that explore solutions to global challenges. You’ll learn in small classes taught by faculty who are accomplished scholars and passionate teachers who will become partners on your educational journey. 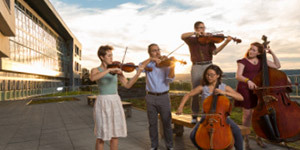 You’ll conduct research with faculty, intern in your field of interest, participate in field work and performances, and create projects that provide the kind of practical, hands-on experience that makes employers and graduate schools take notice. You will benefit from some of the finest facilities you’ll find on a college campus. The Park Center for Business and Sustainable Enterprise features a sophisticated trading room with the same software and real-time transaction capability found on Wall Street. Production studios in the School of Communications offer high-tech resources that would make some media outlets envious. Students learn science by doing science, using the same instruments as professionals. Students in the Humanities and Sciences put theory into practice through a wide variety of experiential learning activities. Performance spaces for music and theatre arts offer world-class acoustics and ambience. 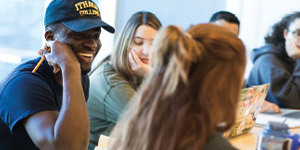 With 6,200 undergraduates, the Ithaca College community is small enough to feel close-knit but large enough to offer a broad array of ways to get involved. 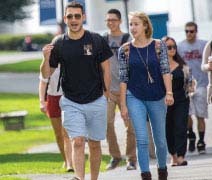 Ithaca College offers more than 200 student organizations focused on academic and professional fields, leadership, community service, the arts, and other interests, so you can develop talents, sharpen leadership skills, and make connections that will enrich your learning and your life. Ithaca also has 27 Division III intercollegiate sports teams, plus more than 40 intramural and club sports. All of this happens in Ithaca, New York, a vibrant cosmopolitan city of 47,000. Ithaca is known for its progressive character and its abundance of outdoor recreation opportunities, and it is frequently included on “best college town” and “most livable city” lists. Ithaca College graduates have made their mark around the globe in just about every field imaginable. You’ll find recent alumni working as music directors, investment analysts, journalists, filmmakers, research scientists, small-business owners, and athletic trainers for professional sports teams. They go on to many of the finest medical schools, law schools, MBA programs, and other graduate programs in the United States and beyond. With an Ithaca education, you can count on being confident, prepared, and ready for whatever comes next in your life. The Office of International Programs provides a comprehensive orientation program for new students, and support services continue throughout your education. The Office’s staff will introduce you to other students on campus, offer immigration information, and take you on regional trips. The Ithaca area combines unique sophistication and diversity in a stunning natural setting. Ithaca College and nearby Cornell University each attract an international population from dozens of countries. Our diversity is reflected in the local cable channel’s programming (which includes news broadcasts from many countries) and in places of worship, grocery stores, and fine ethnic restaurants. Applicants should submit their completed application, recommendation, and transcripts from secondary and postsecondary institutions; actual or predicted national or international academic program exam scores (if available); and proof of English proficiency. Submission of SAT and ACT scores is optional. Some programs require auditions, interviews, or portfolios. International applicants are eligible for institutional need- and merit-based scholarships.